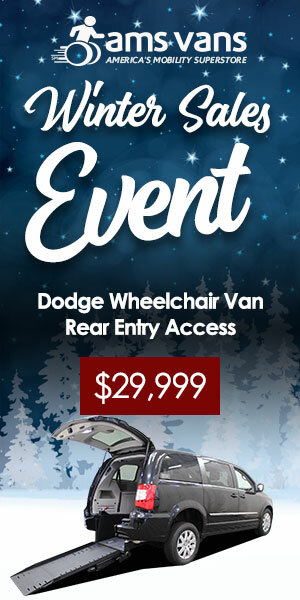 The Wheelchair Accessible Vans section spotlights wheelchair vans in the news. We’ll explain the handicap vehicle laws and regulations behind handicap parking placards, handicap parking spaces, handicap parking permits, and other topics pertaining to accessible vans and their users. Look for illumination on new wheelchair vans, used accessible vans and information about converting existing vans into handicap accessible vans. For most people, the arrival of spring means merely taking off their snow tires. It is, however, much more than that. A harsh winter can take its toll on your vehicle. Here are just a few tips on how to not only get your accessible vehicle ready for spring but also repair the damage that might have been done by the harsh winter conditions. Winter can be tough on all vehicles. Your vehicle has been through a lot. From salt and brine to the potholes. Road salt helps against ice, but it causes a lot of damage to cars. It can even cause brake failures. Salt-filled brine coats your vehicle’s underbody, and if left unattended, it will begin to erode. It is therefore recommended to take your car for an undercarriage wash.
Pay attention to the door, ramp, and kneeler. Ensure the sliding door is free of debris. Fix any exposed, frayed, or damaged wiring on the sliding door. If your vehicle has a folding ramp or an in-floor ramp, spray hinges with a silicon-based lubricant. Ensure you can operate them without any issue. Contact AMS Vans service department to find out how to have your ramp, hand controls, and other accessible features serviced. During winter, the vehicle usually deals with a lot of slippery conditions. In addition to that, the bumps from snow and ice will cause vibrations that loosen the alignment over time. Wheel alignment extends your tires’ life, steering control, vehicle performance and improves fuel efficiency. When removing your snow tires, also check for feathering. If the feathering is too bad, it may require replacing of your tires. Ensure proper inflation of your warm weather tires. The impurities picked up from gritted roads might clog the brakes. Abrasions that usually appear in winter could lead to bodywork rust. Ensure you have your chassis checked during service. To get ready for the heat, you should double check the air conditioning as well. Turn the AC on and make sure that max chill effect is achieved. Look out for any strange odors or noises coming from the system. Winter conditions can damage your windshield and wiper blades. Repair the wiper blades if you notice they are frayed or torn. Run them across your windshield, looking out for streaking or other signs of malfunction. To avoid a complete windshield replacement, repair the chips that might appear on your windscreen. Lastly, top up the washer fluid whose levels might be a bit low after a winter of clearing away the grime and salt deposits from your windshield. Start the engine and listen for any abnormal noises; rattling, grinding or clicking. Check to make sure your oil level is topped up. Take the accessible vehicle for an oil change if you feel it’s necessary. Look at your coolant and brake fluid. If your brake fluid is low, it is a sign the brake pads could be worn down. Check the battery for corrosion on the terminals. Clean them off with a toothbrush, a little baking soda, and elbow grease. Disconnect it first. Checking the shape is more complicated since it requires a battery tester. Take the car to a garage to find out if the battery needs recharging or replacement. The better you take care of your car, the longer it will last. AMS Vans is committed to supporting our customers throughout the process. However, if you feel that it’s time for a new look for a new season, we’ve got you covered! Why not trade in your accessible vehicle for a newer model? We offer a wide range of new and used cars. Browse our inventory here. If you or a family member has been struggling to get in and out of a wheelchair accessible vehicle, you know the effort is sometimes enough to discourage you from traveling entirely. An adaptable vehicle isn’t that much of a resource if it requires too much energy to operate. However, a new wheelchair lift can change your mobility outlook entirely.